The R is to the recently unveiled Shelby GT350 as the Boss 302 Laguna Seca was to the Boss 302 -- the ultimate track car among the new generation of Mustangs. The GT350R will also be the first Ford fitted at the factory with carbon-fiber wheels as standard, which reduce unsprung weight by 13 pounds per wheel compared to aluminum. The big-buck rims are fitted with Michelin Pilot Sport Cup 2 track tires. The MagneRide adaptive suspension -- this is the first car to receive it -- is tuned for full track duty. The transmission is a Tremec six-speed manual, and the driveline is updated throughout for better track cooling and durability. Re: Rather be Ded than Zed? There is more than one way to skin a horse. Beyond painted carbon fiber, options include a rear brake upgrade, a custom interior and something called the "Shelby Extreme Cooling system." Brrrr! There's also a 700-plus hp "performance upgrade" available if 627 hp isn't enough for you, as well as a track delivery package so you can stuff your new toy into a wall moments after getting the keys. So what's the difference between the Shelby GT350 and the Shelby GT that's just been unveiled -- besides outrageous horsepower and a supercharged motor? The nomenclature here can be a bit confusing (and it only gets more confusing when you add the Ford GT supercar into the mix): While the GT is actually built by Shelby American in Las Vegas, those GT350s are rolling out of Ford's factory ready to hit the track; they wear they Shelby name under a licensing agreement. Chevy is celebrating the introduction of its all-new sixth-generation Camaro with a unique event that’s open to the public. The company will reveal the new car on May 16 on Belle Isle in Detroit. The Detroit Free Press reports that the new model is slightly shorter because its based on the Cadillac ATS. So watch out Ford Mustang, you’re going to face a smaller, nimbler Camaro! In addition to the reveal, Chevy will have a Camaro Museum on site, meet and greets with Camaro designers and engineers plus hot laps around the Belle Isle Grand Prix course in a 2015 Z/28. The event is free but space is limited. Head over to www.TheCamaroSix.com to register for the event. .....,but apparently doesn't come with a transmission of any sort? Rope-Pusher wrote: .....,but apparently doesn't come with a transmission of any sort? I remember reading that it would be on a smaller, lighter platform, and I got the impression that there would be some serious weight loss, not 5%. It's "speed holes". Get it right or pay the price! The LT 1LE comes with the standard 335-hp V6, the FE3 suspension from the SS including dampers, mounts, toe links and stabilizer bars, lightweight wheels with Goodyear Eagle tires, four-piston Brembo brakes and a mechanical limited-slip differential. Additionally, the 1LE gets extra cooling, the dual-mode exhaust and a few other bits. 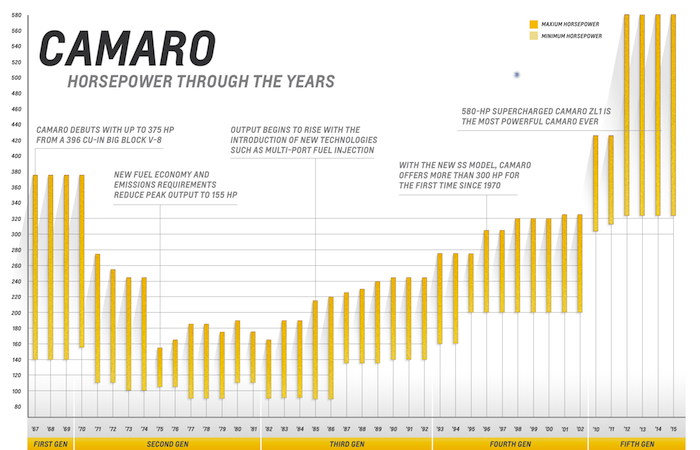 Recaro seats and Chevy’s Performance Data Recorder are optional. The SS also sticks with stock output, which is rated at 455 hp and 455 lb-ft. Both 1LE cars come equipped with a six-speed manual as God intended. What is that thing sticking up out of the console? It looks like a manual shifter, but these days I am wary of making such an assumption without seeing how many pedals it has.